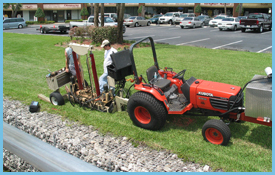 Our combined use of geophysics and standard drilling methods provides a unique approach to subsurface evaluations of project sites. The use of geophysical surveys allows us to rapidly map a specific area and identify anomalous subsurface features (fractures, cavities, ravel zones, etc). The results of the survey enable us to design a focused drilling program that provides a significant cost savings to the client, while at the same time producing all of the necessary geotechnical information to the project engineer for a proper design. Our Cone Penetration rig provides innovative drilling technology to our clients. This system records soil densities and engineering properties (pore pressure, local friction, etc) every tenth of a foot in the subsurface, resulting in the highest resolution data sets possible for geotechnical investigations. 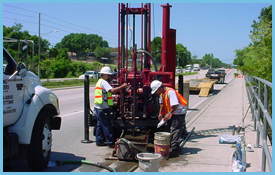 OET also incorporates SPT drilling into many of our projects where physical samples of soils/rock are required to ground-truth geophysical data or undergo laboratory testing for engineering properties (shear strength, compressibility, etc). OET has performed both large-scale geotechnical investigations throughout the Caribbean for resort development, as well as hundreds of sinkhole investigations throughout the state of Florida on residential properties and public roadways.